Carpool lane violations in Nevada have the risk of receiving a traffic ticket, fine and 4 demerit points on your driver’s license for the moving violation. High Occupancy Vehicle (HOV) lane laws are commonly broken when there is only one person in the vehicle or when the hours of operation are not being followed. Carpool lane violations in Nevada have the risk of receiving a traffic ticket, fine and 4 demerit points on your driver’s license for the moving violation. Are There Times I Can Use the HOV Lanes in Nevada? Does a Nevada Carpool Lane Traffic Ticket Hurt My Car Insurance? What if I Have an Out-of-State Driver’s License? Can My Las Vegas Defense Lawyer Reduce My Carpool Lane Traffic Ticket to a Non-Moving Violation? Would It Be Better Just to Pay the Fine for Improper Usage of HOV Lane? Can I Just Ignore My Ticket for Illegal Driving in the Carpool Lane in Nevada? Can I Ask for a Trial? How Long Do I Have to Wait to Seal a Carpool Lane Charge in Nevada? Should I Get a Defense Attorney to Help Fight my Carpool Lane Charge in Las Vegas, Nevada? You can use the high-occupancy vehicle lanes if you are driving in Las Vegas or other places in Nevada. This is only true if you have at least one passenger with you in the car. HOV lanes have certain hours for the exclusive use rules. If you are driving in HOV lanes during the designated hours, you could get a traffic ticket for improper usage. However, a Las Vegas attorney can help to reduce the charges of carpool lane violations to non-moving violations. To avoid carpool lane violations, you should follow the rules set forth for the use of these lanes. It is okay to drive in these lanes if you have more than one person in your car. You can also drive in these lanes if you are on a motorcycle or on a bus. You can avoid carpool lane violations if you use this lane outside of the set hours. In Las Vegas, Nevada, carpool lane designated hours to occur Monday through Friday. There are two time-frames for the designated hours. These are 5am – 10am and 2pm – 7pm. 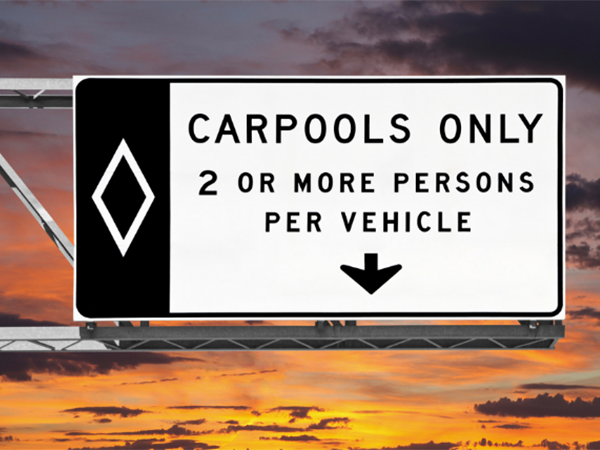 It is illegal to drive in carpool lanes with no passengers or as stated in the rules. You will not get carpool lane violations if you drive your vehicle in one of these lanes at any other time. Improper usage of carpool lanes is a misdemeanor in the state of Nevada. This means that you will face fines of at least $250. However, fines for carpool lane violations in the city of Las Vegas are $352. Although misdemeanors can carry a jail term of six months, carpool lane violations do not. The DMV will give you four points on your license if you are guilty of operating your vehicle in a carpool lane. If you get 12 demerit points in a 12-month period, you could lose your driving rights for six months. You can hire a Las Vegas lawyer to help reduce the charge to an illegal non-moving violation. This will keep the DMV from adding demerit points to your license. You can fight a suspended license by having a hearing with the DMV. However, you may want to get a good defense attorney to help you through the DMV hearing process. Traffic tickets for carpool lane violations carry fines and demerit points. This can raise your vehicle insurance rates. You may want a Las Vegas attorney to help reduce the charges to an illegal non-moving violation. This will keep the DMV from putting demerit points on your driver’s license. If there are no added demerit points, your car insurance should not change. While the court will not make you go to traffic school for carpool lane violations, it might help. If you go to traffic school within five days of your guilty plea, the judge may reduce the charges to a non-moving violation. This will keep you from getting points on your license. You will get the same points added to your commercial driver’s license as for your personal license. Also, you have to tell your boss about the traffic ticket within 30 days. The DMV in the state where you got your license will add points to your license. The number of points is based on the laws of your state. If you are in the country legally, the state will not deport you for operating your vehicle in a carpool lane. However, you can get deported for any reason if you are an illegal alien. You should get a Las Vegas lawyer for any charges against you if you are not a citizen. If you feel you got your carpool violations in error, you can fight the charges in court. As a defendant, you can get witnesses, video, photos, or GPS records to prove your case. You, the defendant, can prove that you were not in the carpool lane at all. You can show that you had a passenger in the vehicle with you or that you were in the carpool lane outside of the set hours. As a defendant for carpool lane violations, your attorney may be able to reduce the charges. You may still have to pay fines. However, the DMV will not add points to your license. You may not want to go to court as a defendant. You may think it would be easier just to pay your fines. However, carpool lane violations are still misdemeanors that end up on your record. To avoid this, you can go to court as a defendant to fight the charge for driving in the carpool lane. Even if you are guilty, you may get the court to reduce the charges to prevent some of the impacts on your record. This can also help to avoid DMV points as well. Driving in the HOV lane without a passenger may seem like such a small thing. However, the court takes all crimes seriously. If you do not pay your fines or show up for hearings, the court will issue a bench warrant. Law enforcement can then arrest you if you commit another offense. The DMV can suspend your license if you fail to appear. Your lawyer can have the judge quash the warrant. The court will also have to clear your failure to appear to prevent the DMV from suspending your license. Operating your vehicle in the carpool lane is only a misdemeanor. This means you cannot have a jury trial, but you can have a bench trial. However, this is not needed. Your lawyer can settle the case before a trial ever occurs. You must wait for a full year after the court shuts the case to seal your file. You do not have to wait if the judge drops your case. Although you do not need a lawyer, it can help in these cases. The lawyer can be there for you in court so that you do not have to miss work. This is also helpful if you live out of Nevada. A lawyer also knows the laws, so may get you better results than if you try to fight the case on your own.